Figurines at a Christmas Market in Dresden. “Ahhh, the Christmas markets in Dresden!”. Her eyes lit up as she reminisced about her visit to the Christmas markets in this eastern German city some years ago. My neighbour’s enthusiasm was infectious and I listened intently as she described the atmosphere and what to expect. As I headed to the station to catch the train to the airport, I thought about her last words: “The Dresden Christmas markets will get you into the Christmas mood. Warm up with glühwein, enjoy the Christmas choirs and don’t forget to have some Christstollen [Christmas fruit bread]!”. 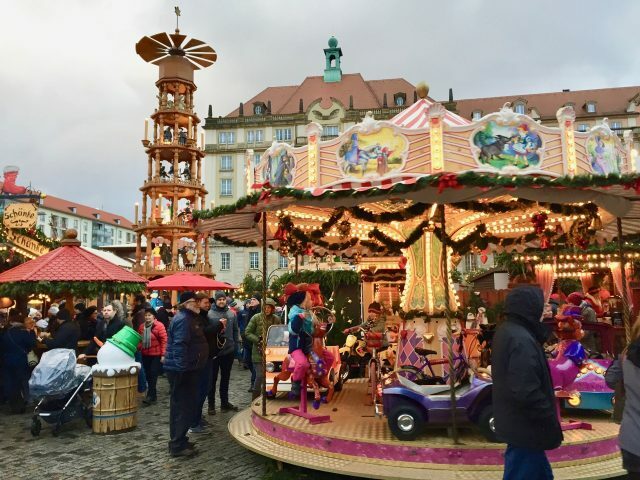 After a hectic few months, I was eons away from feeling anything close to Christmassy, so I felt excited about the prospect of soaking up the ambiance at the Dresden Christmas markets and getting into the “Christmas mood”. Lace work at the markets. Dresden (map) is a historic city in eastern Germany, situated approximately 200km south of Berlin. The historic city centre is very compact and many of the main attractions and the eleven Christmas Markets are within walking distance of each other. The most famous Christmas Markets in Dresden can be found in the Altstadt and Neustadt districts. 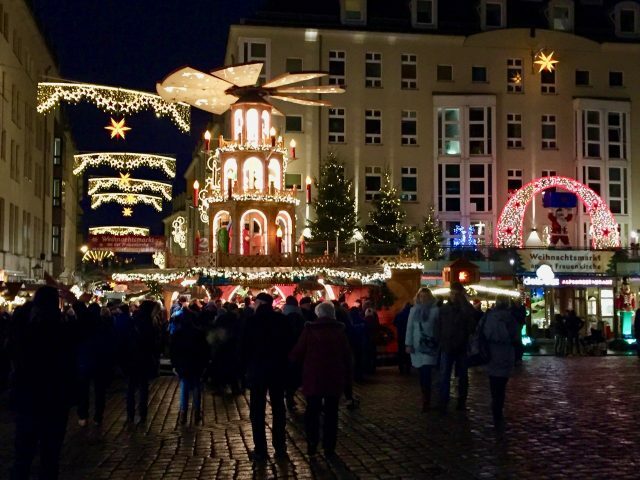 The markets are packed with stalls selling all sorts of local and regional food, traditional Christmas handicraft and of course glühwein (mulled wine) and traditional Christstollen! Many of them also have beautiful Christmas ‘pyramids’ – wooden towers topped with a rotor, with a carousel decorated with Christmas-related figurines. This world famous Christmas Market is more than 500 years old, making it the oldest in Germany! 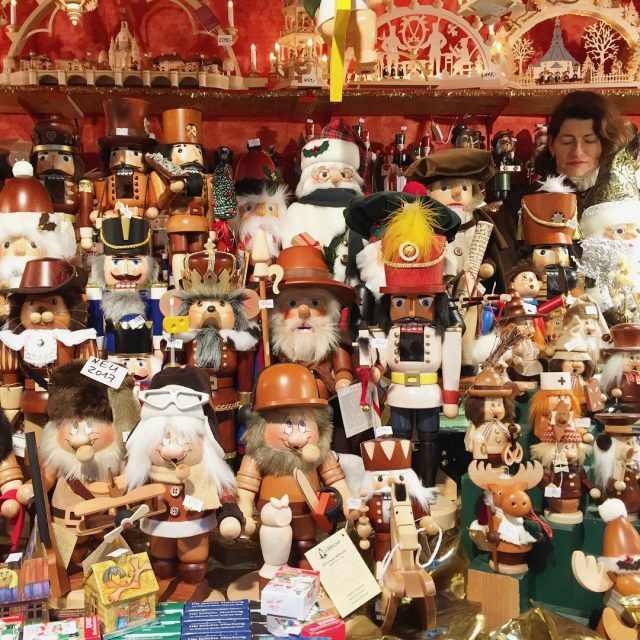 With its fun rides, glühwein and food stalls, and Christmas handicraft, Striezelmarkt is perfect for families and a must-visit! Panoramic view of the Striezelmarkt. Fun rides and the Christmas pyramid at the Striezelmarkt. One of the many food stalls at the Striezelmarkt. The Neumarkt Christmas Market is arguably my favourite. It’s not as big as the Strizelmarkt but I absolutely loved the cozy atmosphere and stalls selling unique crafts. The iconic Frauenkirche forms a gorgeous backdrop for this market, where carollers also regularly perform. While you’re here, drop by the Feuerzangenbowle stall for something a bit different from glühwein – feuerzangenbowle is basically a rum-soaked sugarloaf that’s set on fire and drips into a bowl or pot of mulled wine. A cozy stall at the Advent auf dem Neumarkt. Wooden handicraft at the Advent auf dem Neumarkt. The Weihnachtsmarkt at the foot of the Frauenkirche. Situated in Münzgasse, an alley just off the Frauenkirche, this Christmas Market is popular with locals and visitors alike. The stalls selling glass art, pottery and Vogtland lace are attractions in themselves. And while you’re here, have a glühwein at the eight-meter tall walk-in pyramid! In the evenings, carollers perform on the balcony of the pyramid. The pyramid at the Frauenkirche Christmas market. This little market is located in a square next to two palaces: the Residenz Schloss (Royal Palace) and the Taschenbergpalais. There’s also a gorgeous ice-skating rink inside the Taschenbergpalais (which houses the Taschenbergpalais Kempinski Hotel). You can rent ice-skates and skate around the Christmas tree in the massive courtyard of this grand palace – the atmosphere is simply magical! The adjacent bar also serves a terrific glühwein! My first stop at the Weihnachtsmarkt am Schloss. Christmas handicraft at the Weihnachtsmarkt am Schloss. Delicious sausages at the Weijnachtsmarkt am Schloss. The ice-skating rink inside the Taschenbergpalais. This is the medieval Christmas Market in Dresden. Located in a stunning courtyard of the Royal Palace, the Stallhof market is perhaps the most unique in Dresden. A stroll through this market feels like a step back in time! Expect court jesters, minstrels and medieval armour. There’s also a hot tub (big enough for eight people) if you’re feeling cold! An artist at the medieval Christmas Market. Blacksmiths at the medieval Christmas market. The hot-tub at the market! The Augustusmarkt is situated in Neustadt, just across the Elbe River from the Altstadt. This market, with its local and exotic foods and crafts, is one of the most popular among locals. It’s somewhat different from the traditional markets in the Altstadt in the sense that it exudes a more contemporary atmosphere. There’s also an ice-skating rink at the very end of the market. The blue Christmas tree at the Augustusmarkt. I had a fabulous time in Dresden, exploring the city and its surroundings and strolling around the Christmas Markets. I returned home feeling a lot more Christmassy – I’m pretty sure the festive lights, gorgeous Christmas handicrafts, glühwein and Christstollen had something to do with that! Haha! So, if you’re thinking of visiting a European city for its Christmas Markets, try Dresden! Find out more about the Christmas Markets in Dresden. Each Christmas Market in Dresden has its own unique Christmas mug. When you purchase a beverage like glühwein, the price includes a deposit for the mug. You can collect your deposit when you return the mug or you can keep the mug as a souvenir. These mugs make for a lovely souvenir of your Christmas visit to Dresden! A Christmas mug – a great souvenir idea. Read more about things to do in Dresden. 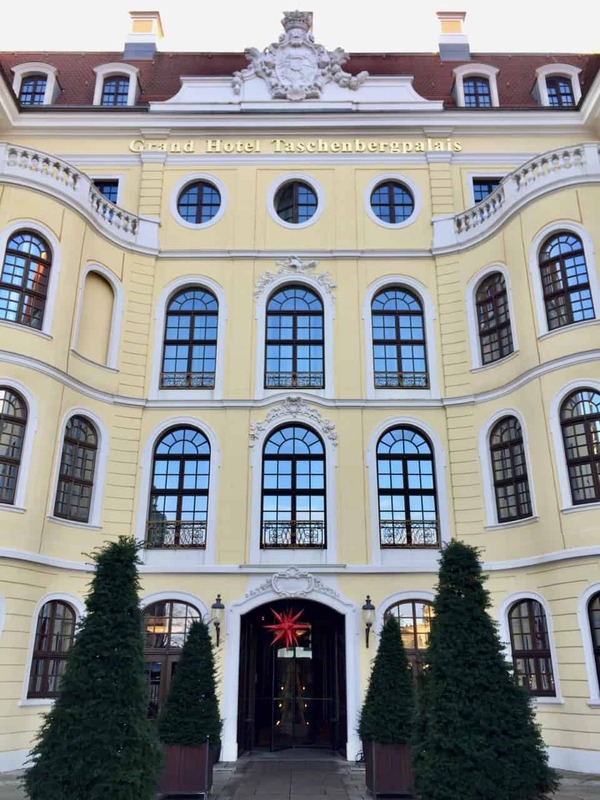 I stayed at the Grand Hotel Taschenbergpalais Kempinski, which is centrally located in the Altstadt, across the road from the Residenz Schloss (Royal Palace) and the Zwinger palace, and the Dresden Cathedral and Opera House are literally a stone’s throw away. The rooms are spacious and tastefully decorated. There are several restaurants and bars – my favourites are the Palais Bistro (great French food in a relaxing ambiance) and the Karl May Bar (excellent cocktails in this cozy pub!). Check out rates for this hotel. My room at the Hotel Taschenbergpalais Kempinski. 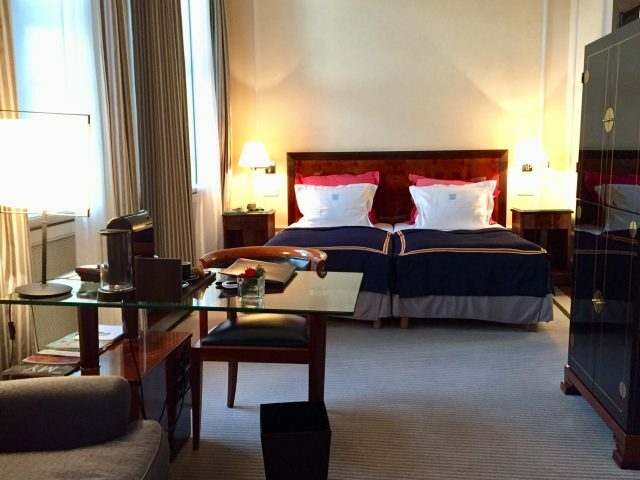 Note: a big thank you to Dresden Tourism and Hotel Taschenbergpalais Kempinski for your terrific hospitality! All views expressed above are mine. ← Destinations to add to your 2018 travel list!